For the first time, both you and your customers will have the information you need for fact-based discussions about inhalation therapy. 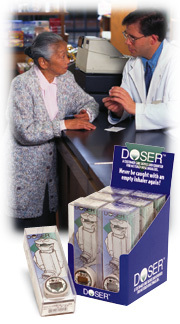 With the DOSER, you will be able to better understand the customer's patterns of medication use. As a pharmacist, you know how confusing respiratory medication can be for your customers, their parents, or their care givers. Keeping track of medication use, getting refills at the appropriate time, or monitoring a child's inhaler use are challenges that are finally met by the DOSER. In-store promotional aids available, including "bag stuffer", brochures, etc. To order the DOSER call us at 1-800-863-9633. The DOSER is available in a retail point-of-sale displayer, containing six individually packaged units. Various sales aids are available: salesaids@doser.com.